Over the past year, the number of people who read an e-book has jumped a lot, especially among twenty-somethings. 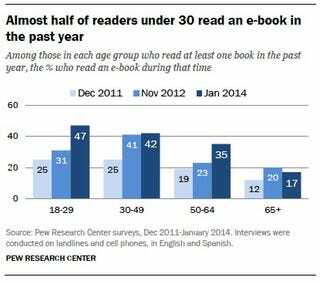 Interestingly, as you can see in this chart from Pew Research Center, the twenty-somethings lagged behind their 30-49-year-old counterparts, who had read more e-books the year before and maintained a steady appetite for them this past year. The jump this past year seems to have mostly affected people in their twenties and fifties, which suggests it may be related to technology adoption — both groups tend to have less spending money for consumer electronics. "Reading" encompassed printed books and e-books as well as audiobooks. Overall, print remains the dominant way Americans read books: More than two-thirds (69%) of people said they had read at least one printed book in the past year, versus 28% who said they'd read an e-book and 14% who said they had listened to an audiobook. 87% of e-book readers and 84% of audiobook listeners also read a print book in the past 12 months.